Christopher Nolan's The Dark Knight was released 10 years ago today. (LOS ANGELES) — Christopher Nolan’s The Dark Knight was released 10 years ago today. Although it’s the second in director/co-writer Nolan’s Batman trilogy, The Dark Knight is not only widely considered his best chapter, but one of the best superhero movies ever made. Much of that well-earned praise hangs on two things. One: Nolan crafted his film less like a “comic book movie” and more like a gritty crime drama that happens to be set in Gotham City. And two: The performance of the late Heath Ledger as the Joker. Ledger died six months before the movie’s release at age of 28 of an accidental prescription drug overdose. 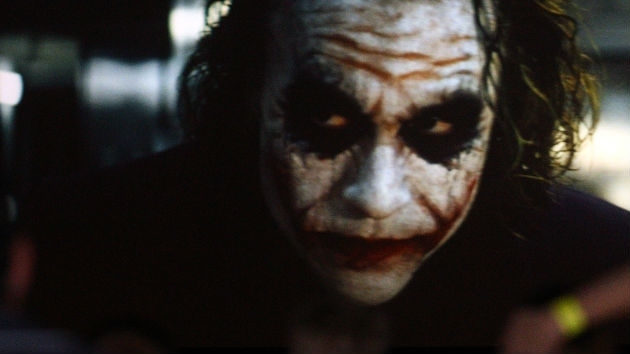 However, his haunting portrayal of Joker as a psychotic criminal genius who turns Gotham upside down was powerful enough to win him a posthumous best supporting actor Academy Award. The Dark Knight also featured strong supporting performances from Gary Oldman as Commissioner Jim Gordon, and Aaron Eckhart, who plays both dashing D.A. Harvey Dent and his villainous alter-ego, Two-Face. The Dark Knight scored the highest-grossing opening weekend of any movie in history to date at that time, raking in nearly 158 million dollars — besting the previous record-holder, 2007’s Spider-Man 3. It ultimately earned $533.3 million domestically and just over a billion dollars worldwide.